Paragliding in Nepal is an adventurous activity. It can be done over the Fewa Lake in Pokhara with full of joy and happiness because we provide you all the technical safety and security. During Paragliding you can see the majestic peaks of Himalayas like Annapurna, Machhapuchhchre, and Dhaulagiri and so on. Paragliding in Pokhara can be the adventure holidays for singles. For doing Paragliding, you need to go to a beautiful valley set on the banks of the Phewa Lake i. e. Pokhara is also popular for its panoramic views of Annapurna, Machhapuchhre (shape of fish tail) in the north, and Dhaulagiri in the west, Lamjung Himal and Manaslu in the east. You can reach there either by plane or by vehicle. After reaching there, you have a short drive to the popular hiking spot, known as Sarangkot. Sarangkot is taken as the popular viewpoint of Nepal too for looking the beautiful sunrise and sunset over the Himalayan ranges. It is highly breathtaking. However, you reach at Sarangkot and take a rest for some time and finally in the paragliding activity. If you are a perfect and an authentic licensed Paraglider and have the strong desire to glide it alone by yourself. You can do it alone. Otherwise, there will be the experienced Paraglider of Nepal with you and do the adventure paragliding activity. While enrolling in paragliding in Pokhara, you get the refreshment and enjoy it in front of the views of mountains over the stunning Fewa Lake. Whether you do it alone or with the Paraglider, paragliding in Nepal can be the immemorial experience of anyone. Rising Adventure P. Ltd. is a young and the energetic adventure activities operator especially in Nepal. If you want to join our Paragliding in Nepal package, we welcome you heartily. For more details, please feel free to contact us. 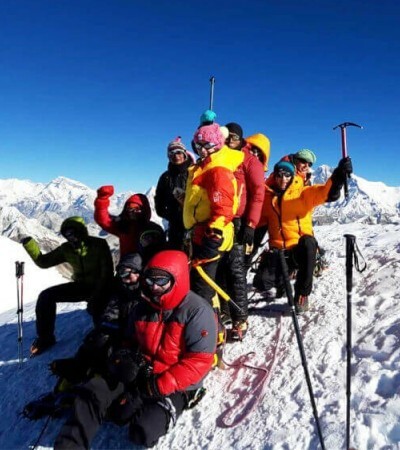 Note: If you have the extra vacation and want to extend the trip in Nepal, we help you in arranging or you can also join our Adventure Weekends Package in Nepal which includes the Paragliding in Pokhara and other possible adventure activities in Nepal.